It’s Easter, which means I’m not going to be around most of the day. 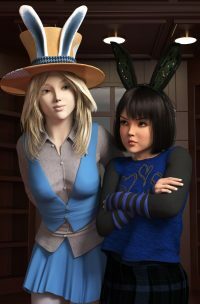 Still, have a pic of my OC’s Jennifer Airhart and Tenley Tych. Tenley’s not really getting into the spirit of things, being grumpy about having to wear those ears (even though those ears Jen made have built-in wi-fi, radio, can generate force fields, pinpoint the source of exotic particles, and the easter eggs she’s hidden). Tenley just doesn’t want to be a bunny, unless it’s one of the mean bunnies from Watership Down.